Seasonal breaks for different regular home use. Suitable for both temporary labor related reasons, study, business, health, hospitalization of people participation in sporting events, cultural events, etc..
Close to taxis, buses, banks, supermarkets, boardwalk, marina, terraces and night pubs, restaurants etc. Shopping malls, park of Santa Catalina, Auditorio Alfredo Kraus. Conversely, old part of the city Cultural Area, Link University, Barrio de Triana, with theaters, home Colon, Catedral de Santa Ana, Vegueta, Museums, Restaurants, etc.. IN THIS AREA VERY CENTRAL CITY, WHICH IS THE ONLY AVAILABLE APARTMENT BUILDING WITH WHAT YOU CAN FILL A HOUSING DEMAND IN HIGH-LEVEL BUILDING NEWLY BUILT. IN FACT IS CONSIDERED AS THE BEST BUILDING OF THIS PART OF THE CITY. lovely designed apartment, can separate the bedroom from living space, separate loo from shower if you want, nicely appointed kitchen, tv with DVD and internet. Situated between the old and new parts of Las Palmas, walk to Vegueta, more like a bus ride to the newer parts and Canteras beach. Only issues, couldn't close blinds in main room or window in the bedroom area (like it was a cm too short) and the road past is a bus route and has recycling banks on it, noisier than I'm used to, annoying but didn't spoil my trip. Note street parking outside free after 6pm m-f, 2pm sat and all day sun and all bar one day out of four found a space outside. Hi at the beginning I was afraid that apartment will not look like on a picture (becouse the last pic was taken in 2013)but it was a positive suprase. Whole flat is keept in really good condition the only thing that is missing is kettle but apart of is everything is there. Location of a flat is pretty good plenty of shops and restaurants around. It is a nice place for a budget holiday. "Great apartment – comfortable and clean, exactly as described and represented in pictures. You will have everything you need to feel like in home. Carlos is reliable host, willing to help and to arrange all questions. House is located between Parque Doramas and la Fuente Luminosa, in center of Las Palmas, very close to several grocery stores, including supermarket. We chose the apartment because it’s near the start of Gran Canaria marathon, so, I can recommend it as a great choice for participants next year. It was not a problem for us, but you can hear the traffic noise as windows leads to street. If you will come by car, you should consider that there are only payable parking places in surrounding (9:00-14:00, 16:00-20:00, about 0.80 EUR/h), but Carlos allowed us to park the car in underground parking during weekend and night times." All fine again, we returned after our first stay here last year. Owner was very helpful despite not feeling well. Apartment is located nicely in between the old city and the beach with plenty of amenities nearby. "One great advantage of this apartment is Carlos, the friendly and helpful landlord who has an office right next door to the apartment, so if there is a problem he is there to help. The apartment is modern, nicely furnished and was clean. It is situated in the centre of the city and right on the No. 1 bus route that goes straight to the theatre in the centre of the old town in one direction and to the port near Las Canteras beach and the shops in the other. You are also within a short walk of the Marina with a number of restaurants and San Telmo square with a bus station with frequent buses to most parts of the island. The facilities were as described and all in new working condition." 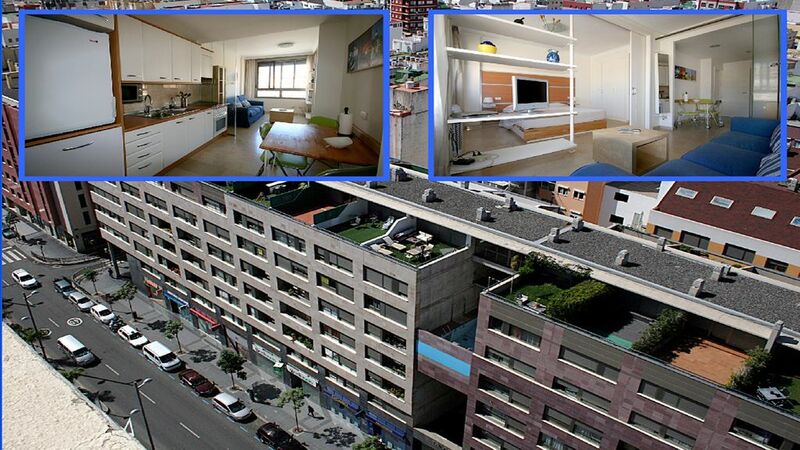 "A very comfortable appartment, at a 10 minutes walk from the old centrum of town. With a friendly, helpfull and reliable owner. The appartment is situated at a busy road, but traffic slows down during the evening. Make sure that you make clear arrangements about cleaning the appartment and a garanty payment, and than its very ok. We enjoyed our stay very much." EASY ACCESS FROM THE HIGHWAY COMING FROM THE AIRPORT( GC-1 )AND FOLLOWS THE COASTLINE OF THE CITY, COMING FROM THE AIRPORT, EXIT THE MOTORWAY AT THE ROUNDABOUT OF JOHN XXIII AND SURROUNDING IT BY CHANGING THE SENSE IN THE NEXT STREET, TURN RIGHT AT THE NEXT TRAFFIC LIGHT YOU CAN SEE NOW OUR BUILDING. WATER SPORTS AND LEISURE ACTIVITIES, BEACH,FISHING, SAILING, SIGHTSEEING, RESTAURANTS, PUBS, THEATERS, CINEMAS, MUSEUMS, SHOPPING CENTERS, ETC. Tarifas decrecientes en función de la duración, tarifa en función del número de personas, fianza pedida, arras/deposito de reserva 20%, entrega de llaves realizada por propietario , presente normalmente durante la estancia, ya que la oficina está en el apartamento próximo.